The true meaning of Sanctuary, a place where animals are brought to live and be protected for the rest of their lives. It was a dream come true! Not only was Mrs Susan Watt and the Sanctuary’s Founder, Mr. Dayton O. Hyde, willing to take in all 17 horses, there was a far deeper connection that I could have never imagined. A serendipitous bond that resonates with the soul of all of those who cherish Louisiana’s unique herds of wild horses. A herd rich with history, culture, and biological significance. The full story of the Fort Polk horses will be shared on Giving Tuesday – November 27, 2018. You CAN make a difference for these rare horses that have found a lifetime of freedom at the Black Hills Wild Horse Sanctuary. Below is see a sneak peak of the Fort Polk Horses’ and the story of their journey to Black Hills. 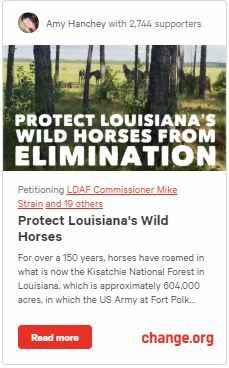 To Learn more about the historical and biological significance of the unique herds of Louisiana’s Wild Horses at Fort Polk, I invite you read the following 2 articles.